RUSH: This is Mario, Toms River, New Jersey. Glad you waited, Mario. What’s happening? CALLER: Hey, Rush. Quick question. CALLER: If America’s such a horrible place to live, according to the Democrats, then why do they want anyone to either immigrate here and/or move here? RUSH: Another brilliant question. That’s why I am glad you held on. And once again it illustrates that it’s not about making life better for these people! If this country is so rotten, if there’s so much injustice here, if there’s so much discrimination, inequality, why would you want to introduce anybody to it? These people are pawns. These people are simply being used as the instruments for the left’s ongoing claim to power. I can’t think of a better question and a better answer to illustrate that they really don’t care about people. One of the greatest political myths is that all compassion resides in the Democrat Party and all indifference and mean-spirited and what have you is on the Republican side. It’s the exact opposite, in fact. 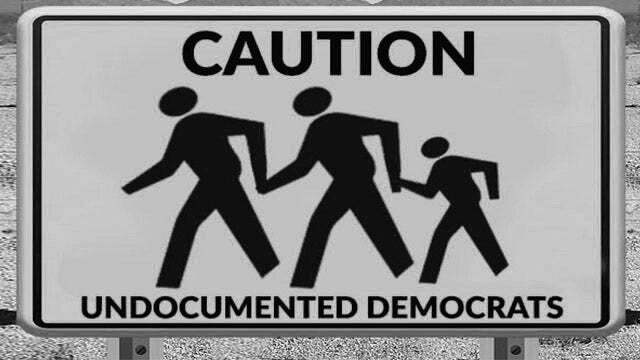 And the very idea that they are willing to have kids travel an entire country or two without their parents, running the risk of serious injury or death or illness, just to get here and become Democrat voters? What does it really say about their thoughts and their compassion for these people? Because once they do get here, they’re never gonna escape the bonds of poverty, by design. And if you’re a Democrat voter in poverty, you’re stuck. If you’re a Democrat voter and you’re a minority and you’re waiting for the Democrats to make life meaningful, you’re stuck. They’re never gonna do anything for you. Because the dirty little secret is — and this is true of so many areas of government — the last thing anybody wants is issues resolved. Issues resolved means business is going out of business. For example, if racism were, quote, unquote, ever solved, then what would Al Sharpton or Jesse Jackson or any of their heirs do? The State Department doesn’t want Middle East peace. They want the ongoing conflict, they want the appearance that they’re working hard to solve it, but nobody wants it solved. The left does not want an end to border problems. They want the open border for the continued influx of people that are gonna end up being their permanent underclass, in utter defiance of the idea that they care about people. That is a great question. Do you have your own answer to it that differs from mine? CALLER: Well, it ties in a little bit to what you were just talking about, the traditions and foundations of America is what the left is against. They want to change it. So it’s purposeful. They want to tear down everything that we, you and I think is right about this country, which goes back to our foundations and our moral code, which is a biblically based moral code. They hate the Bible. They hate when we put our hand on the Bible. And Christians represent that. RUSH: They hate the freaking anthem now before sporting events, they don’t want any part of that. CALLER: They want to tear down what our country is. That’s why they’ve become the enemy. RUSH: Exactly. That’s why there is never, ever any attempt to have any of these immigrants, illegal ones, assimilate and become, quote, unquote, Americans. That’s not on the agenda. Anyway, that’s great, Mario. Thank you very much. RUSH: Reuters is reporting: “Central American migrants stranded on a journey through Mexico –” This again is horribly written. Unbelievable. “Central American migrants stranded on a journey through Mexico because of U.S. –” What happened to the preposition? Has everybody become ChiCom and they drop prepositions now? “Central American migrants [are] stranded on a –” How does this stuff get past editors? I’m gonna tell you, you know, people, “Ah, Rush, this is not a big deal.” It is. This used to be the hallmark of American journalism, English construction, the actual act of writing the language. This is pathetic, as many editors as go through this. It’s just another indication of the absolutely lackadaisical education people are getting. English comp. It’s a requirement for anybody that’s gonna be participating in journalism or history, practically anything else. So, see, now it’s Trump’s fault that these illegal aliens are stranded in Mexico. Yes, it’s Trump’s fault that a bunch of illegals fail to make it here. So a bunch of people were thwarted in their attempt to break federal law, and Trump is at fault. See, Trump should have just announced he would accept these people with open arms and of course the media, the Democrats, would have then loved him.